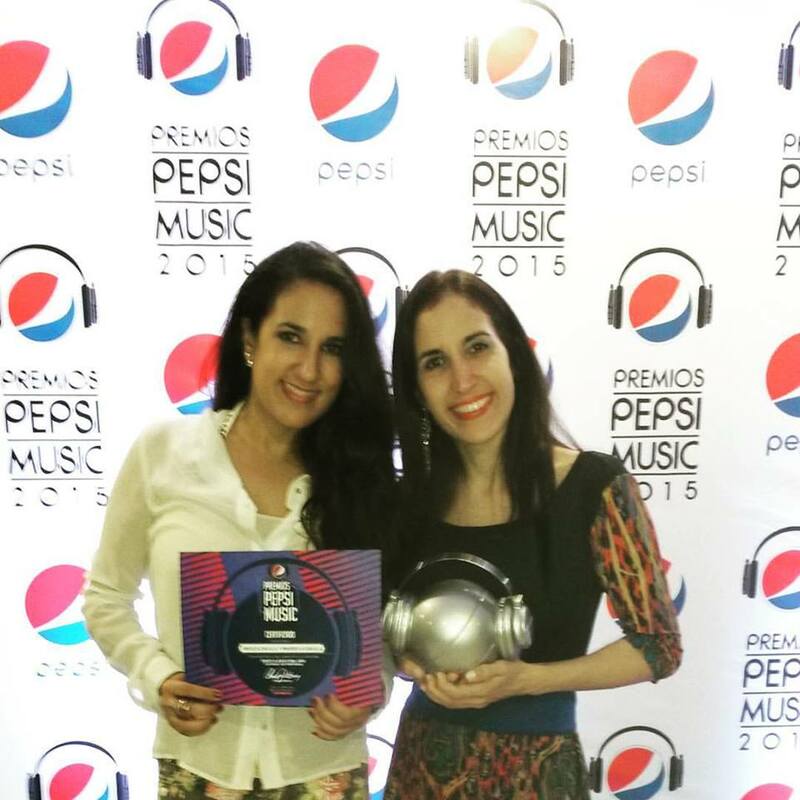 The sisters Prisca and Marieva Dávila continue to reap successes thanks to their album Travesía, and this time they won the Pepsi Music award in the category “Best classical song”, corresponding to their four-hand piano version of “El día que me quieras” . Both expressed their joy and congratulated the Pepsi Music Academy for supporting and promoting music made in Venezuela. 2018 has been a profitable year for the sisters, recently they have come to tour three cities in Canada: Toronto, Montreal and Ottawa, where they received the highest praise. The duo had already won the Pepsi Music Award in 2015, when they won “Best Classical Music Album” for Un Piano, two sisters. “I feel very happy, honored and grateful to the Academy for receiving this award that motivates us to continue making good music. Before so much darkness we have to give more and more light so music and music for the soul, “said Prisca who attended the delivery ceremony. 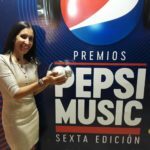 The sisters also congratulated the Pepsi Music Academy for supporting and recognizing the efforts of those who make music in Venezuela. “We thank our team, our family, our allies and especially our audience for the success of our album Travesía, with which we have several projects and pending activities in the near future,” they said. 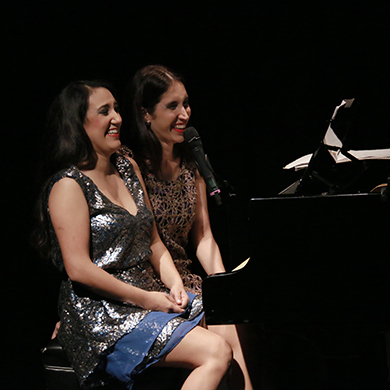 Travesía was launched in 2017 and both sisters participate as pianists and singers. 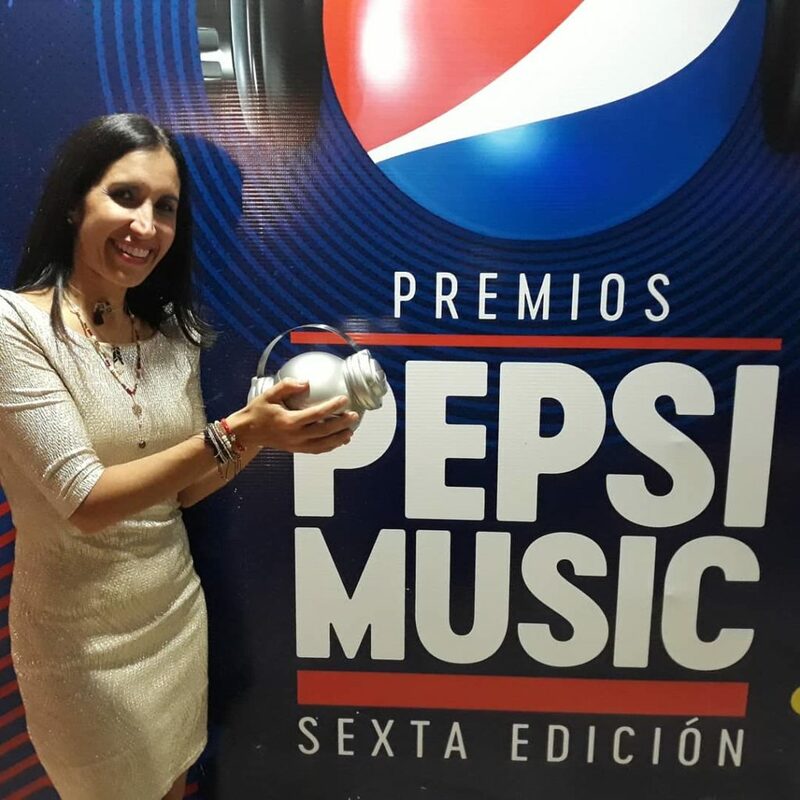 The album features songs composed by both artists, as well as Latin American songbook classics, including “El día que me quieras” (Argentina), which won the Pepsi Music awards. The repertoire of this production has been promoted in concerts in some cities of Venezuela, as well as in the most recent international tour of Canada. A reflection about the times we’re currently going through, a call to rescue society through love and respect. The Venezuelan piano player, singer and music writer MARIEVA DAVILA presents the song “SUBVERSIVOS”, a reflection about the times we’re currently living, a call for love and respect. This song is included in her new album “Travesia”- Canciones de Latinoamérica” (Journey, Songs from Latin America), the second Marieva’s album produced with her sister Prisca Davila who is also a piano-player, singer and music writer. The album “Travesia” includes new songs written by the Davila sisters as well as selected songs deemed iconic by several American countries. All of them framed within the music language characterizing them, a fusion of jazz, flamenco, Venezuelan and classical music. Now in this album she’s also adding other music genres such as pop, rock, bolero, ballad, Latin jazz, tango, and Bossa nova. The piano players and singers explore Latin American genres involving well-known pieces and their own songs. A grand piano reigns at the center of the living room. Surrounded by furniture, tables, book shelves, rugs, and cushions, this instrument of dark and polished wood is the tell-tale piece of two realities: the profession to which the sisters, who lived at that house, have devoted their lives, and the passion and love of a family who has always supported them, certain they would shine in performance arts. Although neither of them lives at that home anymore, piano players Prisca and Marieva Davila agreed this was the best place for this meeting. This is their mother’s house and that is the piano where they both rehearsed and practiced at the beginning of their musical career. Before this fine instrument, they had an upright piano, bought by their parents when Prisca -the oldest- was just a baby. “Our home had no furniture, but they decided to buy a piano, instead of a dining set, even though neither of them played the piano. My mother says it was a premonition,” she says jokingly. Although they are six years apart in age and their personalities are quite opposite, these sisters have built a complicity that goes beyond family ties to reach their musical careers. This bond created during the shared academic sessions with piano player Gerry Weil was strengthened with shared concerts and became solid when they recorded the album Un piano, dos hermanas (One Piano, Two Sisters) (2012) and now is repeated, as is usually the case with great experiences, with the release of the second album jointly recorded by these artists. The album called Travesia (Journey) will be presented at 5:00 pm next Saturday, with a concert at Centro Cultural BOD theater, in La Castellana. In this album, the piano players add their voices to a journey covering well-known Venezuelan and Latin American pieces and genres, as well as some bulerias (Flamenco music) and Jazz pop. In addition, they have added some songs of their own; inspired by the “infatuation” they felt while researching for this project. “It all started by late 2012 when we were invited to give a concert in Mexico and wanted to include a Mexican piece, because audiences there are very nationalistic. The piece we made was a sort of improvised La Vikina arrangement, but we thought we should have an arrangement ready for every country, just in case. By early 2013, we had the first one ready and our passion started to grow”, says Marieva. At this Saturday’s concert in Centro Cultural BOD, sisters Prisca and Marieva Davila will present their new album called Travesia. The piano players and singers will fusion Jazz, Flamenco and classical music, and will also be including genres such as Pop, Rock, Bolero, Ballads, Latin, Jazz, Tango, and Bossa nova. The sisters will be at the stage with their father Eduardo Davila at the Sax and flute; Abelardo Bolaño, drums; Luis Freites, bass; Goyo Reyna, voice, box, and clapping; Leonte Ortega, guitar; Eric Chacon, flute, and Luisa La Polaca and Mariana Pantoja, as Flamenco dancers whose performance will be joined by Marieva. Tickets are for sale at the theater and at www.ticketmundo.com. Their cost is Bs. 3,600. 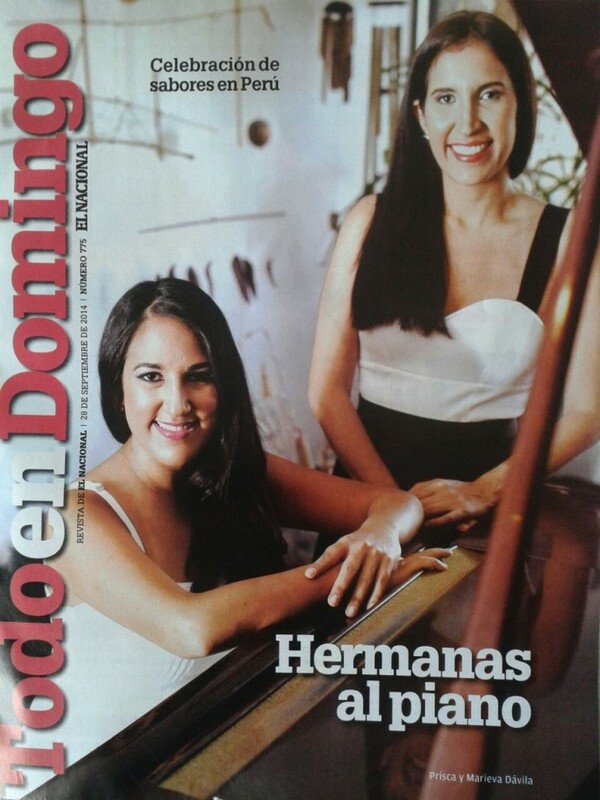 The sisters Prisca and Marieva Dávila, both pianist, composer and singer nominated in three categories of Pepsi Music Award 2015 Venezuela (Best classical artist of the year, Best classical song of the year and Best classical record of the year) were the winners of “Best Classical album of the year with their CD ” Un piano, dos hermanas” (One piano, two sisters). This album shows a fusion with classical music, jazz, flamenco and Latino American music. 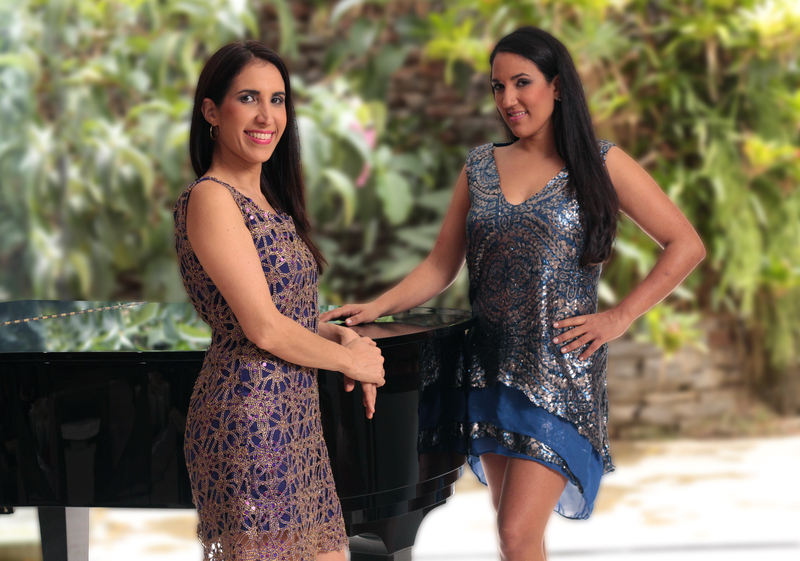 Piano players Prisca and Marieva Davila joined forces and talents in the album Un piano, dos hermanas (One piano, two sisters), where they fusion Venezuelan music, flamenco rhythms, and jazz. Here they tell us all details about this production and the tough part of a simultaneous performance. A cocker spaniel receives visitors with a shoe in his mouth. Apparently this is his “gift” to those he likes. Combo likes taking love from everyone; so much that he even crashed into a photo shooting. His owners accept with ease the pet’s reign, which has to fight for sharing his time with a greater competitor, the baby grand piano located at the center of the Davila’s apartment, a space with view to the Avila mountain, that can either serve to inspire creating repertoires, or calm down Prisca and Marieva’s students, who dream with reaching their teachers’ virtuosity. They have both built a successful career of their own, as piano players, and now, they don’t only share what they know with new generations, but have also joined their skills in a common album. Un piano, dos hermanas is the name of this production joining them and that made them play four hand arrangements in their instrument. The music has further united two talents that were already standing on their own and now demonstrate that, together, they are a matchless musical force. With several individually produced albums, and concert experience, the time to perform together had come. Un piano, dos hermanas includes a repertoire of four hands arrangements and pieces (as soloists) where they fusion classical, jazz, and flamenco music with Venezuelan music. In this project they are joined by their father Eduardo Davila in the saxophone and flute, and Goyo Reyna as special guest. 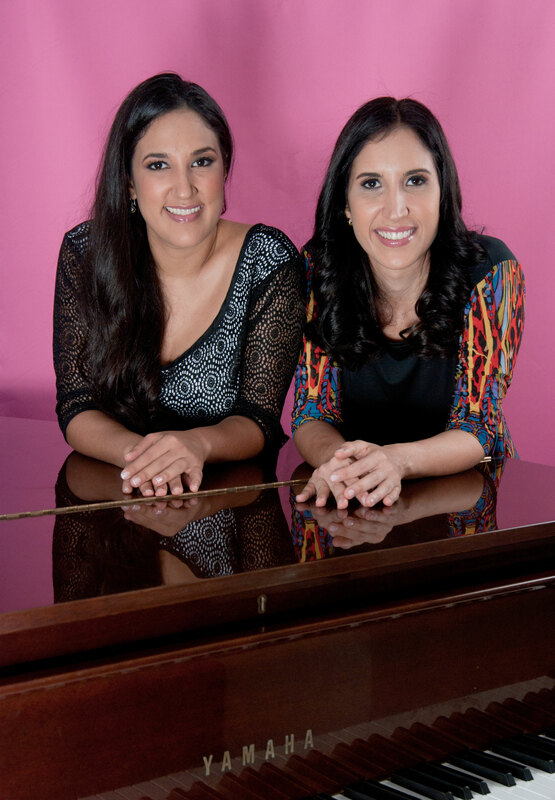 The Davila Sisters will be recording an album as a duo in March, under the name of One Piano, Two Sisters. Last evening, the Ercole Club was full of piano, jazz and flamenco music thanks to Prisca and Marieva Davila that, jointly with their father Eduardo Davila, offered a concert for those in love. The three musicians arrived yesterday morning at Ciudad Guayana and held a meeting with the local media to talk about their evening concert and the plans currently underway. Since very little, Prisca and Marieva have been in the music world, submerged within musical instruments and lyrics. Prisca, for instance, in her two volume album Piano en canto venezolano (Piano in Venezuelan singing) has worked on several country regions, studying their genres and musical compositions. “Including, among them, the Calypso piece Isidora by composer Lourdes Basanta. But we won’t be able to perform it here, as its format needs different instrumentation,” she explained. Now after all these music studies, the sisters’ talents and their father’s talents intermingle on one stage. “This is a fusion or all our musical influences and also of all our musical instruments,” highlighted Prisca. Prisca and Marieva will be going into the recording studio in one month. But besides recording this album, Prisca is planning a great celebration for her 10 year anniversary in the recording industry. “My first album was released 10 years ago, Piano Jazz Venezolano (Venezuelan Piano Jazz) and I have several activities underway, my new album release, concerts with the Symphonic Orchestra and other concerts, to gather this 10 year anniversary celebration, all what has happened since this first album was released, which also was the album that defined my musical language; these 10 years must be celebrated,” she highlighted. Before saying goodbye, a topic that was left on the table: the Davila sisters will be waiting to see if, in the near future, they can perform a concert with Cuidad Guayana Symphonic Orchestra. The piano players, with Eduardo Davila, sax and flute player, offered an unrepeatable concert full of genius. The audience in Barquisimeto, as always, did warmly welcome the sisters Prisca and Marieva Davila last Monday night, during the concert they staged at the Medical Association in State of Lara. These artists offered, before a packed audience, a heartfelt and emotional concert, as part of the Jazz Cycle currently held in the city of twilights for the 15th anniversary of the Hidden Music program founded by late Julio Cesar Fernandez, currently conducted and produced by B.A. Omar Aguirre. The Un piano dos hermanas (One piano, two sisters) recital also included the Eduardo Davila, a Barquisimeto native, Prisca and Marieva’s father, who included sublime keys from both his saxophone and his flute into the concert. Exactly at 8 o’clock p.m. started the banquet prepared by the Davila family. The fist one to conquer the stage with her talent was Marieva, who played the piece “Viraje” (Turn) she dedicated to her sister Prisca. After ending this first piece, she interacted with the audience asking about potential names for a new piece. Then, she went on with a 4×4 tango she dedicated to her mother, accompanied by her father in the flute and by the audience with their claps. Afterwards, a polo margariteño (flamenco palo from Margarita island) was played as a piano four hand arrangement by Prisca and Marieva, who wore exquisite outfits with colorful flowers as headdresses. The song flew out from the sisters’ fingers reminding us about the sea breeze and waves. Their hands seemed to navigate over the piano. Prisca Davila played pieces from her new production Piano Jazz Venezolano II (Venezuelan Piano Jazz II). Flamenco Dancer Marieva Davila followed the rhythm from a sublime pajarillo. Flute and sax player Eduardo Davila shared the stage with his daughters in an extraordinary way. The Davila sisters demonstrated their talent. With the same charisma and flair she always shows, Prisca addressed the audience to say how happy she was for coming back to Barquisimeto, and the Medical Association stage, which she considers as her home. “I feel like if I was at my home’s drawing room sharing with my family, I’m very happy to be in Barquisimeto,” she said. The waltz Paz y jazz (peace and jazz) was the first piece performed by the also composer before the packed audience that surrendered to her friendliness and charm full of virtuosity. The artist dedicated this piece to Jacques Braunstein, one of the top spreaders for this genre. “The country needs peace and jazz”, stated the artist. She added this piece is part of her new album Piano jazz venezolano, which includes a fusion of Venezuelan, academic and popular music with jazz. Pirca continued the feast with the piece called Marieva. “My grandmother, my mother and my sister share the same name… so with this song I kill three birds with only one stone.” This time she was joined by a saxophone, deliciously played by Mr. Davila. “My father is from Barquisimeto, an architect, and a flute and sax player, and above all, crazy,” added Prisca. Afterwards, a rhythmic salsa piece streamed over the room. Prisca played with grace and easiness her version of El Manicero (the Peanut Vendor) by Moises Simons. So the music from the piano, the flute and the audience applauses mixed with joyful passion. Prisca continued with Tonada de Ordeño (the Milking tune) by Antonio Estevez and Quirpa (a joropo variance), garnishing the piece with her velvety voice, wrapping up the room from start to end. The emotion filling Mr. Davila`s face is evident when seeing his daughters so full of talent and life. He watched them with great joy from a side of the stage, while waiting for his turn to play, in memorable complicity, with the Davila sisters a Pajarillo (folk song from the Venezuelan planes) in a piano four hand arrangement, that Prisca called Piquirrillo. “This is one piano, two sisters and a father,” joked Prisca who started playing alone while her sister danced on the stage, showing her wonderful flamenco tapping following the sublime flamenco rhythm. The audience said goodbye to the Davila family standing up and with great applauses, while asking them to come back soon. Music: The debut album Piano de Ida y Vuelta (Piano Back and Forth) is available in record stores. The piano player, Prisca Davila´s sister and Gerry Weil’s pupil has mixed academic and popular music. 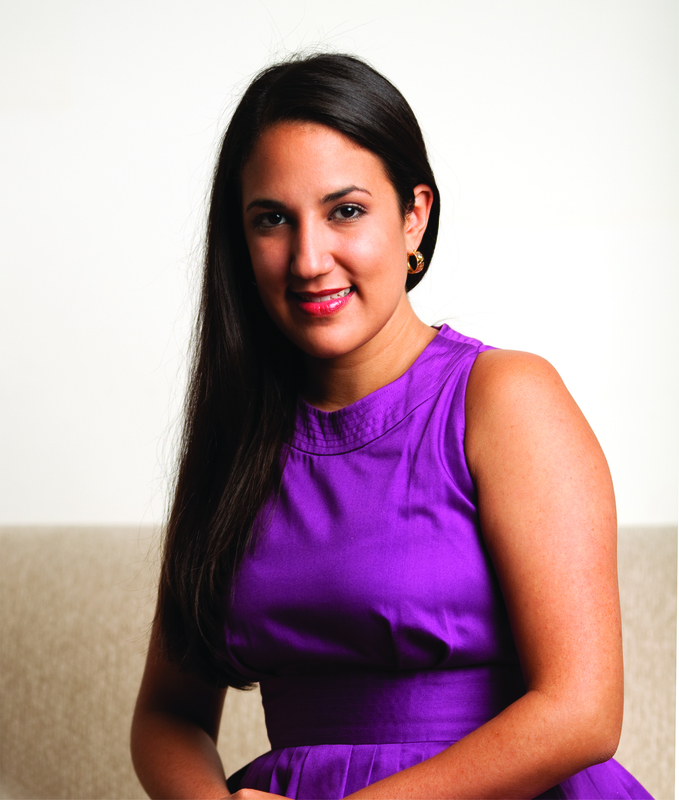 Piano player Marieva Davila, Prisca’s sister, already knew the musical language when she was 10 years old, and began her piano lessons at Juan Jose Landaeta Conservatory. After 15 years, guided by her mentor, Gerry Weil, she started to write music. Her first piece of music was “Viraje” (Turn) that in a second episode became a 3 piece suite, now used as introduction in her debut album Piano de Ida y Vuelta. The piano was a regular friend at the Davila’s home, a family that has acted as fertile soil for musical proposals. Even, as anecdote, we’ve learned the girls were allowed to paint on the walls so that their creative impulse would not be affected. Prisca Davila has recorded four albums, including the two albums Piano en canto venezolano (Piano in Venezuelan Songs) and is one of the most loved pianists for the public, always happy to welcome her jazz mixes with Venezuelan music. Now, her sister Marieva – six years younger- is making her fist steps in performance arts. Her proposal is even closer to the academic world. Her album is an anthological work showing her findings as performer and music writer up to this date. She prepared an extensive program and decided to release the evidence. So she used her sister’s recording sessions to crash into the studio and just feel what is was like. She was not totally happy with the academic repertoire, so she decided to include the De ida y vuelta suite she had written, that goes through the waltz “Travesía” (Journey), the ballad “Viraje” (Turn) and a quite particular tango “Destino” (Fate). To this triad she added some arrangements as “Midnight Mood” by Joe Zawinul, “Gentle Rain” by Louis Bonfi, “Retrato Solemnisimo de Aldemaro Romero” (Aldemaro Romero’s Highly Solemn Portrait), by Juan Carlos Nuñez and “Teresita” by Teresa Carreño. The album’s title, recorded in a piano solo format, suggests a trip to the Baroque period, yet with a return ticket to contemporary times. The album’s backbone includes the Prelude and Fugue in F minor by Johann Sebastian Bach, as well as Rhapsody Op 79 in B minor by Johannes Brahms and Impromptu Op 90 Nº 2 by Franz Schubert. “The album emerged in a quite spontaneous way, the title, as the pieces selected, and the recordings were performed without giving too much thought to it”. Explains the artist, who is also a journalist and flamenco dancer in Derly Ramirez Group, with which she has performed in London, Prague and Seoul. “No one in my family has ever danced flamenco. I joined the Pasion Flamenca academy with some money my grandmother lent me. I did so because felt attracted to it and I wanted to work out, yet flamenco dance has become one of my great passions, up to the same extent as the piano,” she adds. Marieva Davila wants to deepen on her musical research in the fusion of several elements: jazz, Venezuelan music, and flamenco music. She also confesses her interest in recording more albums, especially if she’s able to add voice, bass, and percussion. The 25 year old performer is currently studying some topics of modern harmony, composition and improvisation with Weil. She also receives popular signing lessons from Marisela Leal and studies piano at Lino Gallardo Music Academy. Up to this date, her proposal has been performed in scenarios such as the National Library, the Teresa Carreño Museum, the Quinta Anauco Colonial Art Museum, the Keyboard Museum, the Bellas Artes Museum and the auditorium in Banco Mercantil building. In the near future she’s planning to perform a piano recital at Centro Cultural Corp Banca. 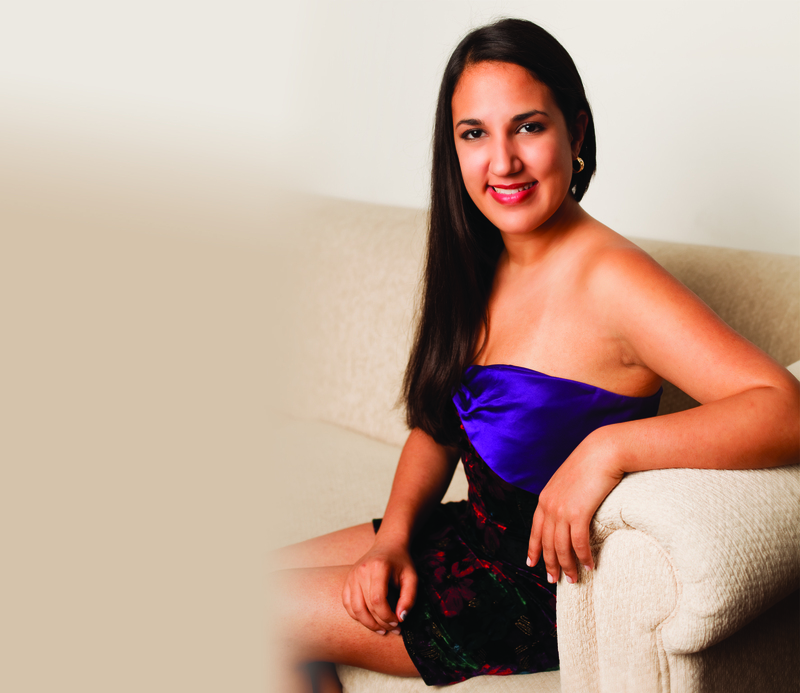 Marieva Davila, sister of singer and piano player Prisca Davila, shall debut as soloist with her album Piano de ida y vuelta (Piano back and forth). This album brings an assortment of music pieces influenced by flamenco music and songs from the new world. “This album bears such name due to the influence of flamenco Spanish art on my music writing, and the sound journey that goes into the past and comes back to the present, hand in hand with universal and contemporary composers,” highlights Davila, who besides being a piano player is also an outstanding flamenco dancer. The album includes three songs by this artist: a tango, a waltz, and a ballad that jointly form the opening suite. Also including pieces from Venezuelan authors, such as Juan Carlos Nuñez with Retrato Solemnisimo de Aldemaro Romero (Aldemaro Romero’s Highly Solemn Portrait) and Teresita, a waltz written by Teresa Carreño. “Due to the deep admiration I feel for Aldemaro Romero, I was pleased to record a song dedicated to this great Venezuelan character. In her turn, Teresa Carreño is undoubtedly a relevant character in universal music, both as piano player and composer. She’s an example to follow not only as artist but also as a woman, because she never feared to outstand at a time when men ruled,” explained the piano player. Classical composers were not excluded from this debut album. Pieces by Bach, Schubert and Brahms are performed with graceful elegance and unique style. On the other hand, fusion jazz master, Joe Zawinul is also present with Davila’s version of Midnight Mood. “In this production I gather several music genres I have studied throughout my life, and are reflected in the musical language I’ve started to develop in the De ida y vuelta suite. You can appreciate the Venezuelan music over the waltz; jazz over harmonization and improvising; flamenco music over the rhythms and melodies I’ve learned as flamenco dancer, besides all the atmospheres and performing resources arising from academic music,” pointed out the artist. The album was produced by her jointly with her sister Prisca and her father Eduardo Davila. “Both of them (Prisca and Eduardo) have influenced me in all possible ways. After my father studied music, my cousins have all studied music at one time or another. My sister, on the other hand, has influenced me due to her personality, her musical taste, and her life style. She encouraged me to record this album.